In December last year, 2015, a Banksy work was spotted on a motorway in proximity of the white marble town of Carrara coming from the north. The new piece is an intervention on one of the motorway’s road signs indicating the local sights. 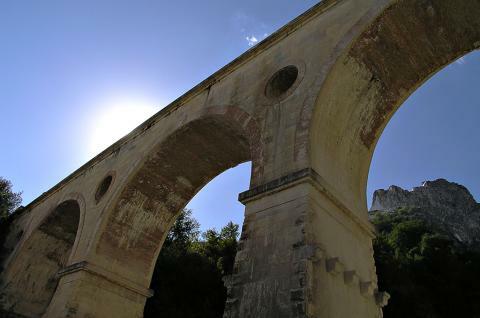 This one in particular depicts the famous Ponti di Vara, which was once the marble railway used to transport the marble from the Apuan Alps to Carrara. 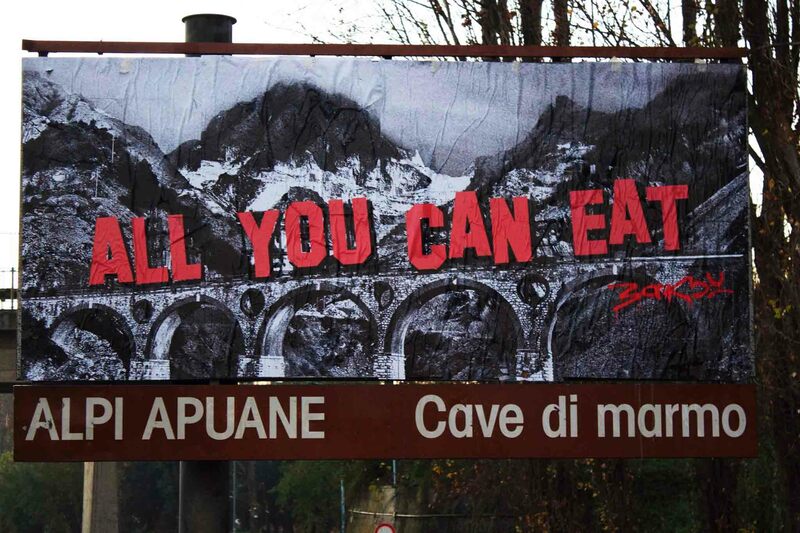 Banksy covered the mountains behind the bridges with an Hollywood-like sign: ALL YOU CAN EAT. Underneath the unmistakable signature of the English artist. Most probably the artwork is an environmentalist condemnation of the degraded exploitation of these majestic marble mountains. For years the intensive industrial methods used to deplete this precious marble has spoilt one of the world’s most stunning natural beauties. Carrara marble has already been used by Banksy in 2009 in the exhibition “Banksy vs the Bristol Museum”. 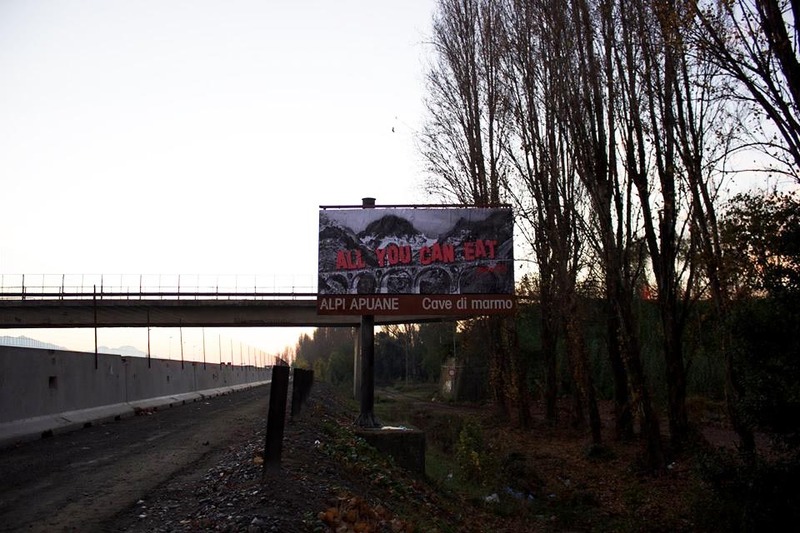 Regretfully, between Christmas and New Year’s Eve, the artwork was removed by the society who manages the motorway. Just a few weeks before Banksy had created several murals in the vicinity of Calais, France, including the so-called “Jungle” where migrants live as they attempt to enter the United Kingdom. One of these included the piece The Son of a Migrant from Syria depicting Steve Jobs as a migrant. 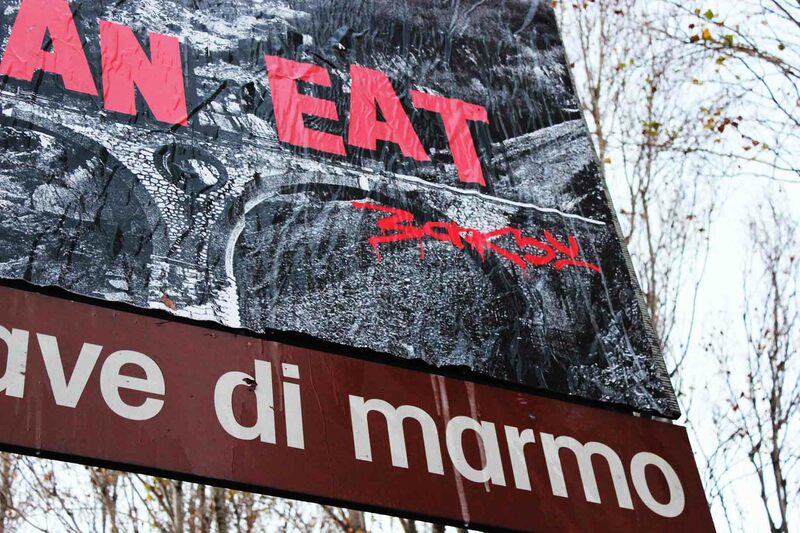 For the first time in Italy the English graffiti artist has displayed his art on a publicly visible surface and for a very honourable cause. As always. Questa voce è stata pubblicata in Apuan Alps, Carrara, Events on the Apuan Alps, Tuscany e contrassegnata con Banksy, Carrara, Carrara marble, environment, exploitation, Ponti di Vara. Contrassegna il permalink.